Editor’s note: This article was originally published on February 9, 2010. The decaffeination process described here has since been shown not to be effective. My thanks to Nigel Melican of Teacraft.com for his note on this. It’s the long , cold days of winter where I live, and tea is something I drink for taste, but also for warmth & alertness. But in my former days of more-coffee-drinking-than-tea-drinking, I was hooked on the caffeine levels in coffee vs. tea. If you’re new to tea-drinking or are interested in keeping yourself alert with a drink that’s more natural than soda and gentler to your system than coffee, read on, McDuff. I’ve got the caffeinated scoop for you here. Black teas definitely have the highest caffeine content of any tea leaves, but how much is “the highest”? Black tea generally ranks as The Most Caffeinated with anywhere from 23mg to 110mg per cup. Oolong comes in second with 12-55mg per cup, and Green & White teas are at the bottom. Green tea has anywhere from 8-36mg per serving, and White tea has even less: 6-25mg per cup. Of course, the length of steep, the temperature of the water, and the amount of tea leaves (and the size of the cut of the leaves) also affects how much caffeine makes it in to a cup of tea; leaves that are steeped in hot water for a long time release more caffeine than the same leaves that are steeped in cooler water for a shorter period of time. This is part of the reason why green & white teas have a lower caffeine-content; they both benefit from a shorter steeping time at lower brewing temperatures. Still, even at 110mg of caffeine per cup, black tea is close to rivaling coffee, but the roasted beans still have more “juice” at nearly 160mg per cup. I’m very fortunate in that caffeine in tea doesn’t seem to affect me like caffeine in coffee or soda does. 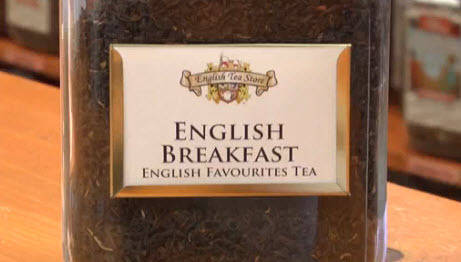 I can drink a cup of Irish Breakfast tea right before bed and still sleep soundly and fall asleep quickly. But if you’re sensitive to caffeine, there are options – short of going the decaffeinated route. You can brew your tea leaves with water that is slightly cooler than you normally do; it’s reported that 80% of the caffeine is released by the leaves within 30 seconds of steeping. This means that you can brew your leaves at the normal temperature for 45 seconds and then discard what you’ve steeped. Most of the caffeine will be gone by that point. Then use the same leaves with slightly cooler water and steep for the directed-time; you’ll end up with virtually no caffeine in your teacup & all of the flavour that may not be available in decaffeinated teas. If you like what you’ve read here, make sure to check out Sue’s blog, A Mother’s Heart! Unfortunately my dear you are talking undiluted nonsense about caffeine – as a few minutes research on the net would show you. Please do not regurgitate nonsense – do your homework. Hi, Nigel, thanks for catching that. I am currently moving old articles from our other blog to this one and should have made a note that this method of decaffeination is an old idea that does not work. I am sure the author of this article has since learned the truth here. I have now noted at the top of the article that tea is not decaffeinated after a few seconds of steeping.